With medical marijuana now legal in some 15 states, it was only a matter of time before someone began taking companies in the weed business public. Today, Bloomberg profiles ex-Morgan Stanley investment manager turned marijuana-growing trailer manufacturer Derek Peterson. Peterson is the founder and CEO of California-based GrowOp Technolgies, a company that he plans to take public later this year. Peterson's trailers, which sell for between $30,000 (the "little bud") and $80,000 ("the Big Bud"), come outfitted with a complete cultivation system; "lighting, temperature, nutrients, water and humidity can be operated remotely via an iPhone app." Of the numerous interested clients he's encountered in his short time in the reefer trailer industry, Peterson says, "They see the green rush -- and like the gold rush back in the day -- are getting picks and shovels." Another California company thriving thanks to the legalization of medical marijuana is General Cannabis, which has already filed for its IPO. 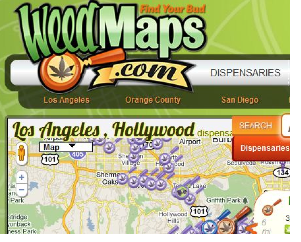 Headquartered in Costa Mesa, General Cannabis "operates several businesses, including WeedMaps.com, which directs users to more than 800 pot dispensaries nationally; a company that handles administrative tasks for more than a dozen medical marijuana clinics in California; and a payment-processing service for dispensaries." According to General Cannibas' CEO Jim Pakulis (who says "medical marijuana could be a $60 billion industry nationwide), his firm is not a marijuana company but "a technology company with an affinity toward medicinal cannabis." Either way, thanks to that affinity, the Wall Street value of its IPO is currently $10.5 million. Of course, all this means that it might not be long before banks will be hiring analysts and bankers with expertise in the grass-growing industry (ex-Bear Stearns CEO Jimmy Chronic Cayne might be able to get back in the business, after all). Which leads to me to wonder: which firm will emerge as Wall Street's leading medicinal marijuana investment bank?